Dynamic clamp is a hybrid computational modeling and patch-clamp approach used in cardiac electrophysiology research. Custom software modules developed in the Real-Time eXperimental Interface (RTXI) framework (www.rtxi.org) are used to perform real-time computations and feedback to the patch-clamp amplifier. To couple an in vitro cardiomyocyte with a computational model of a cardiac cell, membrane potential is recorded from the patch-clamped cell, while the membrane potential of the model is computed in real-time. A gap junctional current is then calculated and injected into the in vitro cardiomyocyte via the amplifier. The end result is real-time electrical interactions between the two ”cells” as if an intercellular gap junction physically coupled them. 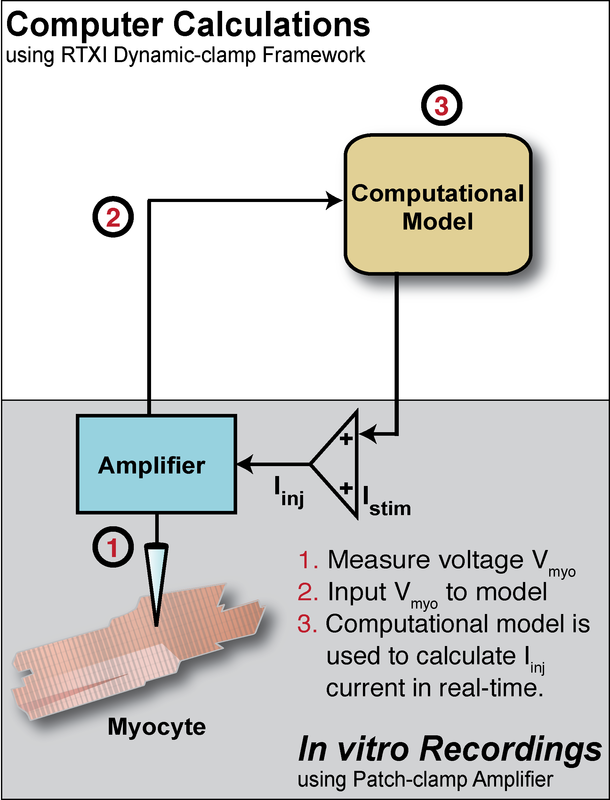 A computational model, which describes the time and voltage dependent membrane current of a cardiac cell is used to calculate and inject a current to which will scale the desired membrane current in the in vitro cardiac myocyte. The end result is a real-time mimicking of pharmacological manipulations in the context of a whole cell. “Rapid Genetic Algorithm Optimization of a Mouse Computational Model: Benefits for Anthropomorphization of Neonatal Mouse Cardiomyocytes.” Frontiers in Physiology. 3: 421. 2012.